Angela is still looking for this Pooh. 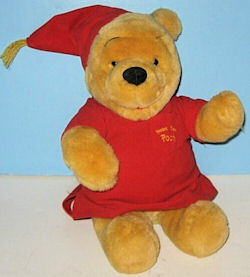 I am looking for the original Disney 13 inch Winnie-The-Pooh Heartbeat Bear Stuffed Toy. It was sold probably about 8 years ago or so and it wasn’t a crib toy. It was the Pooh Heartbeat Bear, but it didn’t have two settings like the newer version has. That one is a different bear. It was a stuffed Pooh bear with a red heart on the inside that when pressed sounded like a beating heart. It’s not a beanie bear. It’s not small, it’s a regular size bear. It has a small red heart that goes in its chest that when pressed makes the sound of a heartbeat. It was available through Disney around 1998. It’s no longer available through Disney. I would appreciate any info about where I can find one of these to purchase. Are you still searching? Could one of these be your bear? I suspect it is the middle one more on ebay if it is search pooh heartbeat. Let us know how it works out. These three are on ebay now.